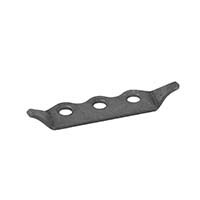 This is a 3 hole cable tab mainly used to attach the throttle cable on a dragster. The tab has 2 small bent ears and fits on a 5/16" tube. The holes accomodate #10 screws. The base width is 7/8" and the thickness is 0.063". The hole size is 3/16" and the height of the center line is 0.438".